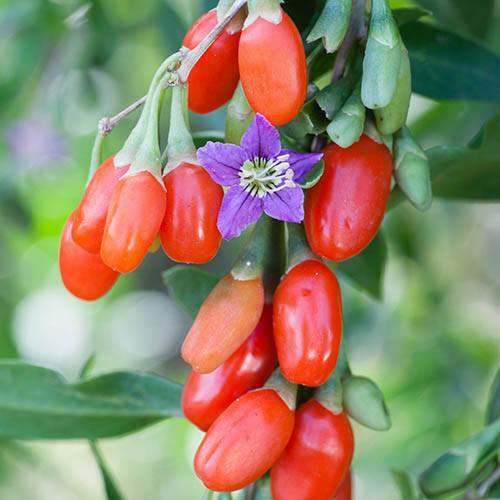 Now you too can pick scrumptious super Goji berries from your own garden! One of the healthiest fruits you can eat - packed full of antioxidants, vitamins and minerals. Great tasting whether eaten fresh or used to make wonderful desserts, sauces and puddings! Very easy to grow, fully hardy and heavy cropping in autumn. Gorgeous berries and stunning foliage! Supplied as a pack of 3 established plants in 9cm pots. Each will grow to about 1-1.5m (4-5ft) tall. Now you too can pick scrumptious super Goji berries from your own garden! This amazing plant has some of the healthiest fruits around, and best of all they taste great! They are rich in super healthy antioxidants, vitamins and minerals, and are wonderful in sauces, puddings, and desserts. Pick them straight from the bush or dry them for a yummy, healthy snack. Goji plants are very easy to grow anywhere and very hardy. Fruiting profusely each autumn, this new variety is widely grown in China for commercial berry production & is the highest yielding and sweetest tasting. Whats more, they have gorgeous berries and stunning, colourful foliage, so they will look great in patio pots! Supplied as a pack of 3 established plants in 9cm pots. Each bush will grow to about 1-1.5m (4-5ft) tall. If planting in a pot, choose a container with good drainage holes, and use a John Innes No 2 potting compost with added grit or sharp sand. Apply a liquid fertiliser (such as tomato feed) fortnightly during the growing season. If growing in a bed, plant in free-draining soil incorporating plenty of well-rotted garden compost or manure. Feed in spring with a general purpose fertiliser such as Fish Blood and Bone, or our Blooming Fast Superior Plant Food.